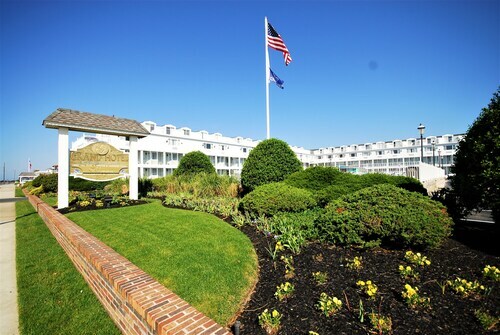 With direct access to the beach, this Cape May hotel is within 1 mi (2 km) of Poverty Beach, Nature Center of Cape May, and Cape May Convention Hall. Colonial House and Emlen Physick Estate are also within 1 mi (2 km). Situated by the sea, this hotel is steps from Poverty Beach and Easy Lynne Theater Company. Cape May Convention Hall and Washington Street Mall are also within 5 minutes. 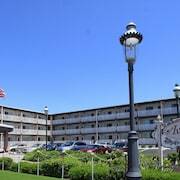 Located in Cape May, this beachfront hotel is in the historical district and within a 15-minute walk of Poverty Beach and Cape May Convention Hall. Colonial House and Easy Lynne Theater Company are also within 1 mi (2 km). 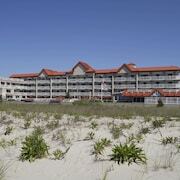 Nestled on the beach, this Cape May hotel is within a 15-minute walk of Poverty Beach and Cape May Convention Hall. Colonial House and Easy Lynne Theater Company are also within 1 mi (2 km). 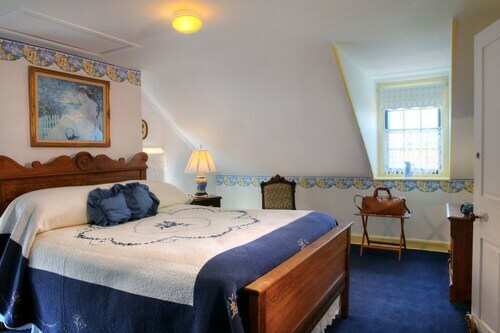 Located in the heart of Cape May, this motel is within a 10-minute walk of Emlen Physick Estate, Mid-Atlantic Center for the Arts, and Colonial House. Poverty Beach and Cape May City Hall are also within 15 minutes. 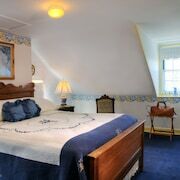 Situated by the ocean, this motel is within a 10-minute walk of Colonial House, Cape May City Hall, and Emlen Physick Estate. Cape May Stage Professional Equity Theater and Mid-Atlantic Center for the Arts are also within 10 minutes. 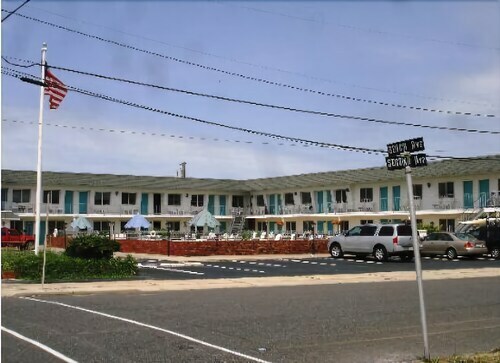 Nestled on the beach, this Cape May hotel is within a 15-minute walk of Poverty Beach, Cape May Stage, and Washington Street Mall. Cape May Stage Professional Equity Theater and Easy Lynne Theater Company are also within 1 mi (2 km). 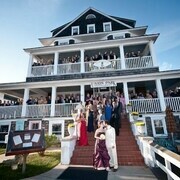 This Cape May hotel is within approximately one-quarter mile of the Cape May Stage and the Cape May City Hall. The Emlen Physick Estate is a mile away. 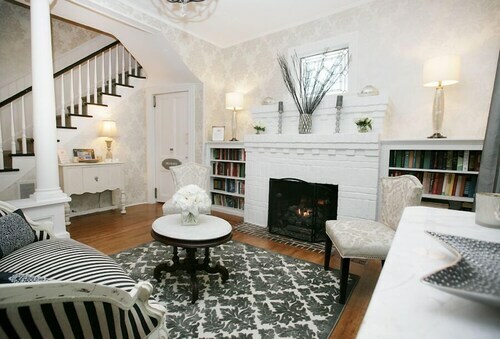 Situated in Cape May, this bed & breakfast is within a 5-minute walk of Easy Lynne Theater Company, Poverty Beach, and Cape May Convention Hall. Cape May City Hall and Washington Street Mall are also within 10 minutes. 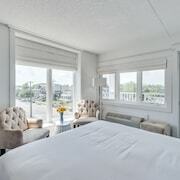 Situated near the beach, this romantic bed & breakfast is within a 10-minute walk of Cape May Stage Professional Equity Theater, Washington Street Mall, and Cape May Stage. Cape May Model Trains and Poverty Beach are also within 15 minutes. 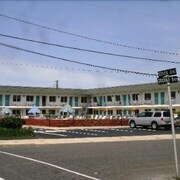 Situated near the boardwalk, this hotel is steps from Poverty Beach and Cape May Convention Hall. Easy Lynne Theater Company and Colonial House are also within 10 minutes. 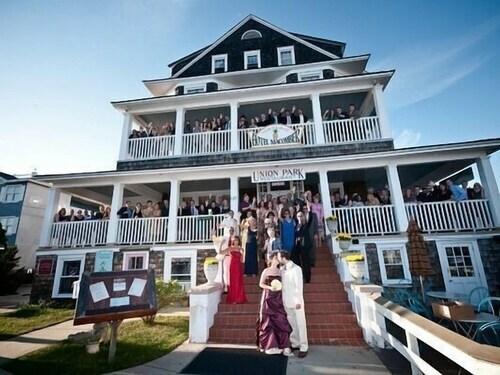 How Much is a Hotel Room in Cape May? 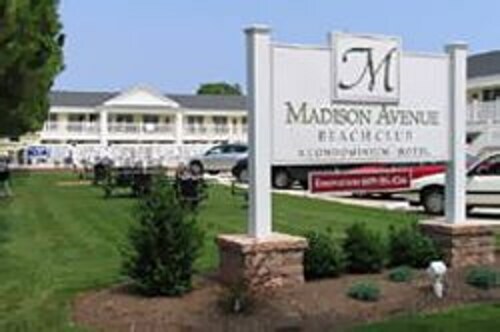 Hotels in Cape May start at $69 per night. Prices and availability subject to change. Additional terms may apply. 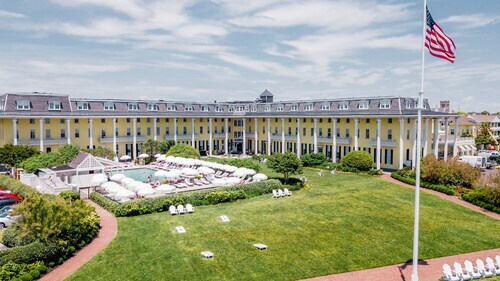 One of America's oldest resorts, Cape May is set among the picturesque landscape where the Delaware Bay meets the Atlantic Ocean. 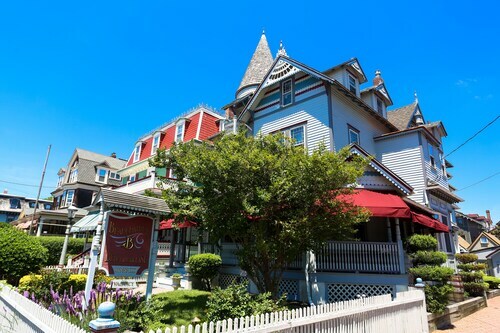 A dreamy Victorian town, this beautiful coastal area is no ordinary New Jersey beach town. Its modern beach scene exists alongside a unique culture and refined personality. A National Historic Landmark, Cape May exudes a distinct charm that has been lost to the ages elsewhere. 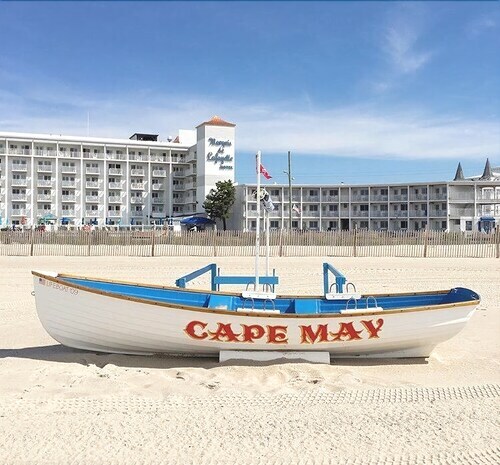 Celebrated for their ambiance, Cape May hotels provide access to this potent combination of historical architecture, award-winning beaches, and celebrated bird-watching locales. One of America's oldest resorts, Cape May resides in a picturesque landscape where the Delaware Bay meets the Atlantic Ocean. 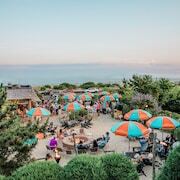 This beautiful coastal area is no ordinary New Jersey beach town; its modern entertainment scene exists alongside a unique culture and refined personality. In fact, this National Historic Landmark exudes a distinct charm you may have thought was lost to the ages. 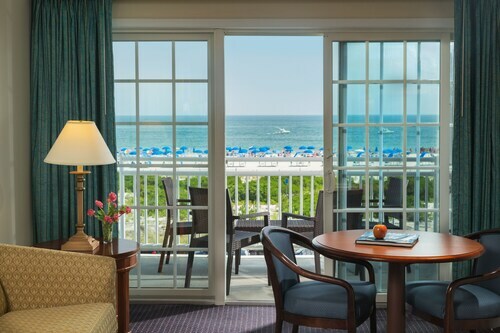 Travelocity’s fine Cape May, NJ hotels on the beach—which are celebrated for their ambiance—provide access to this potent combination of stunning architecture, award-winning beaches, and celebrated bird-watching locales. 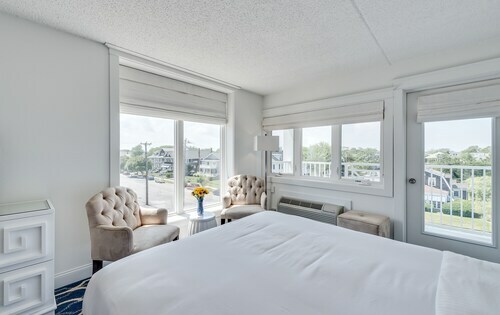 Cape May, New Jersey hotels are often historic sites worth exploring themselves—the Avondale by the Sea Motel in particular. Bicycles are a great way to see the town and traverse the boardwalk, and if you're looking to be active, you're in luck: The Cape offers opportunities to kayak, jet-ski, parasail, skydive, go boating, and play miniature golf. You'll want to make sure you catch a glimpse of the cherished local wildlife on bird-watching tours, or on whale and dolphin-watching excursions. And if you're hankering for a treasure hunt, Cape May can deliver! Search the beaches, especially Sunset Beach, for what locals call "Cape May Diamonds"—pieces of quartz that float down on the Delaware River. Cape May is a place for elegant indulgence. You can take brewery or winery tours and sample the fine beverages produced locally. There’s restaurants all around town, and you're bound to find something that fits your needs, whether it's fine dining, a casual diner, or somewhere child-friendly. And with the savings you’ll get by booking one of our discount hotels in Cape May, NJ you can enjoy a dinner theater show—a delightful combination of entertainment and gastronomy. Already fantasizing about Victorian buildings by day and the lull of the waves at night? Search Travelocity and book a hotel by the beach in Cape May today. Plus, get mobile exclusive deals with the Travelocity app. South Jersey is yours for the taking. Clean hotel and property, it's right across the street from the beach, I felt very safe while staying there, clean and well lit stairways and elevators. Parking is a breeze, easy and plenty of parking. Check out was fast. Pleasant and helpful front desk personnel. Beautiful, steps from the ocean, restaurant is excellent, on a cool evening have a drink by the wood fireplace. Rooms were clean and well put together. Super comfy bed and pillows. Was a nice quiet and relaxing staycation. Lovely hotel...very dated but the location can’t be beat. Layout of the room is very nice...small kitchenette but with everything you need. Furniture in the room is quite old but I found it to be charming. Beach is right across the street so you have a great view. Would return! Love the room and pool and the view from our balcony. In room 166. Nice B and B- excellent breakfasts the 2 mornings we stayed. Close to the beach, close to shops and town and PLENTY of restaurants. The room was nice; my ONLY issue is that we had a top floor room with gabled ceiling. If my wife and I were tall, it would have been problematic. The TV with built in DVD player and a community library of DVDs was a somewhat antiquated way to watch a movie by 2018 standards, but, we really enjoyed the option! Overall REALLY enjoyed our stay.